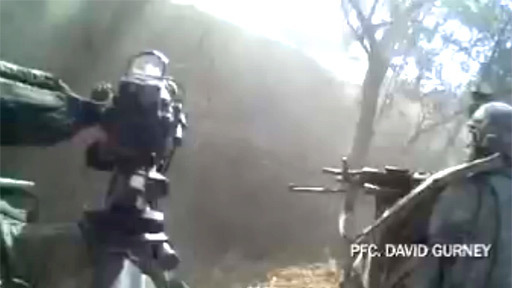 Watch this amazing 7:33 real-life helmet cam video of a battle in Afghanistan, edited by the New York Times. It's kind of funny how desaturated and colorless the video is. Just like in the video games! At one point, Watch the second time they come under fire. Watch the squad and the "player"; they go to great lengths to avoid stepping into the irrigation ditch. On a strategic level, maybe the water would get their equipment wet and less-functional -- but wouldn't the trench give them more cover? On a cultural level, slimy irrigation water is gross. How do we represent the consequence of materials / materiality in an FPS? Portal 2 presents a really blatant treatment of materials in the form of brightly-colored gel; but will it ever possible to represent how gross wet toilet-paper feels? They hold their fire / conserve their ammo a lot. I think it's pretty clear we don't want to model this, though, because running out of ammo isn't "fun." Reloading your gun while running seems pretty hard to do in real-life. They do not know the exact layout of the level, but they know rough architectural schemas: "this 150 x 150 enclosed orchard was unusual for that area." If we wanted to model that thinking, maybe we should only have procedurally-generated levels, in order to encourage pattern-recognition over rote memory. At the end, they hug each other. Hugging is clearly important to the narrative of this battle. Why isn't "hugging" a game mechanic? Why aren't there any first person huggers? (Other than Portal 2?) Dear Activision: I want to kiss my squadmate's forehead at the end of a round.